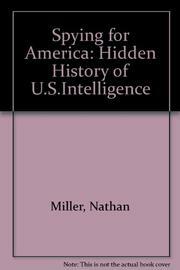 Although Miller grandiosely claims that this is the first attempt to survey two centuries of American intelligence efforts within a national framework, not much is new here, though it's nice to have it tidily in one place. Miller covers the "Tub Plot"; Pinkerton's Hattie Lawton; the Van Lew Ladies (especially Mary Elizabeth Bowser, who's interesting enough to have her own book); Lewis and Clark's "covert military foray": and Lincoln's personal spy William Lloyd. The author also shows us Alfred du Pont snooping on gunpowder in France and Belgium; Herbert Yardley amusing himself by deciphering President Wilson's personal correspondence; and Stimson and Herbert Hoover balking together. Also included are: J. Edgar Hoover and his mandate for ousting "subversives," Donovan and the North African campaign, the tappers at "Harvey's Hole," Dr. Gottlieb's poisons--along with a discussion of Kissinger (described as looking like a "Bronx butcher and operating with the cynicism of a Renaissance cardinal") and hints about Lyman Kirkpatrick's CIA analysis, which is still locked away in a secure vault. This, then, is a fact-filled study of the people behind the 200-year-old American intelligence community, assessing their roles and their yearnings (William Casey, for example, wanting to replace the CIA statue of Nathan Hale with one of Wild Bill). A solid primer, from the author of F.D. R. An Intimate History (1983), etc.